The Response Evaluation Criteria in Solid Tumors (RECIST) guidance was introduced in 2000 and revised as RECIST 1.1 in 2009. RECIST was put together with the goal of standardising and simplifying tumor response criteria. The important role of imaging in response assessment was recognised, and specific imaging guidelines were included. The significant imaging-related changes in RECIST 1.1 in comparison to RECIST 1.0 included a reduction in the number of lesions to be addressed, from a maximum of 10 to a maximum of 5 and from 5 to 2 lesions per organ; assessment of lymph node size; and clarification of what constituted disease progression. The definitions of response within the RECIST guidance are addressed within this chapter in addition to the limitations of using tumor size alone as a biomarker for tumor response. Other methods of assessing tumor response such as response to immunotherapy (iRECIST) and response on PET-CT (PERCIST) are also included. Malempati S, Weigel B, Ingle AM, Ahern CH, Carroll JM, Roberts CT, Reid JM, Schmechel S, Voss SD, Cho SY, Chen HX, Krailo MD, Adamson PC, Blaney SM. Phase I/II trial and pharmacokinetic study of cixutumumab in pediatric patients with refractory solid tumors and Ewing sarcoma: a report from the Children’s Oncology Group. J Clin Oncol. 2012;30(3):256–62. https://doi.org/10.1200/JCO.2011.37.4355. Mullen EA, Chi YY, Hibbitts E, Anderson JR, Steacy KJ, Geller JI, Green DM, Khanna G, Malogolowkin MH, Grundy PE, Fernandez CV, Dome JS. 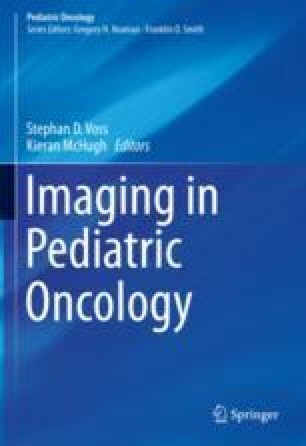 Impact of surveillance imaging modality on survival after recurrence in patients with favorable-histology Wilms Tumor: a report from the children’s oncology group. J Clin Oncol. 2018:JCO1800076. https://doi.org/10.1200/JCO.18.00076. [Epub ahead of print].